I had a productive day, but not without it’s difficulties. After lunch I headed to the Gare de l’Est and managed to get my Navigo pass, but not at the office I was directed to yesterday. They sent me someplace else, but I was successful, and it was only the fifth place that I tried! Pass in hand I boarded the Metro and headed towards Notre Dame area where the office to get my phone SIM card was located. I was pleasantly surprised at how easily I found my way on the metro, and soon I was standing in front of the correct address, but the office was closed. I did have a backup plan in place (I am starting to figure out how things operate here) so back on the Metro and I headed to the next address I had for a SIM card dealer. I found that one without too much difficulty, but they no longer sold the cards, so I set out for the third address, a place called Fat Tires Bike Tours. It seemed a strange place to buy a SIM card, and I was starting to feel a little bit desperate. 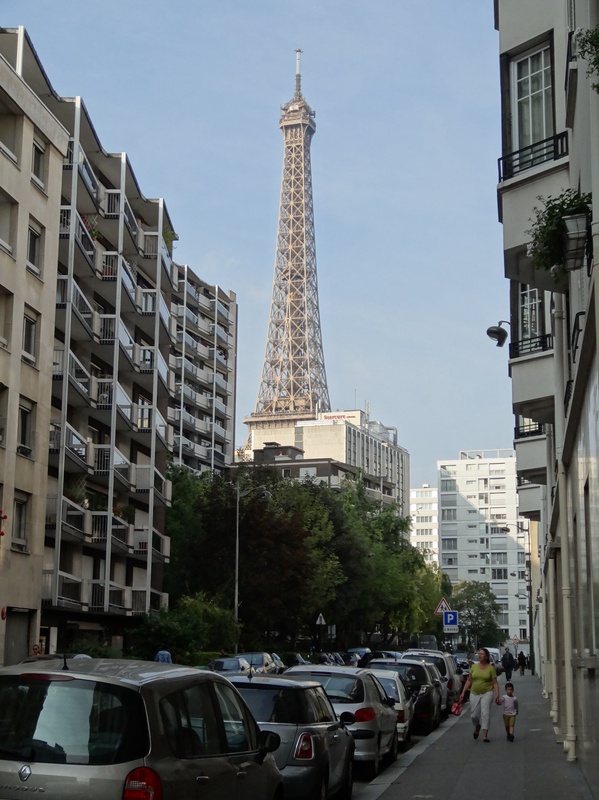 My apartment is in the north east corner of Paris, and I was now in the south west part of the city. 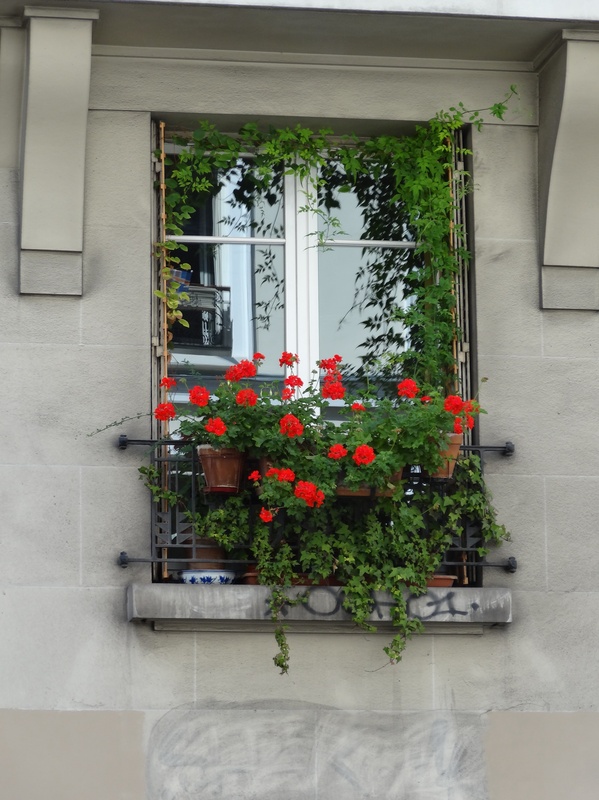 One of the many windows with geraniums on my walk. I was having a bit of trouble finding this place in spite of fairly good directions from the lady at the second store. I decided to try to buy a map as backup, just in case I got really lost. A car rental place sold me a Michelin map called Paris par Arrondissement but the street I needed was not in the index. The man selling the maps tried to help, and then another fellow looked up the address on his cell phone, so I at least had an idea of it’s vicinity. After a long walk and retracing my steps a couple of times I actually found the place, and yes, they sell SIM cards and yes! they speak English! That was a relief, as I was running out of options. Turns out the process is not an easy one. It took two very nice young clerks more than an hour to get me set up and they needed to use the chat line with someone at the online site. They were so kind, I don’t think I would have managed this on my own, especially with a brand new phone that I really don’t know much about. I gave them a generous tip for all their help, it was well worth it. 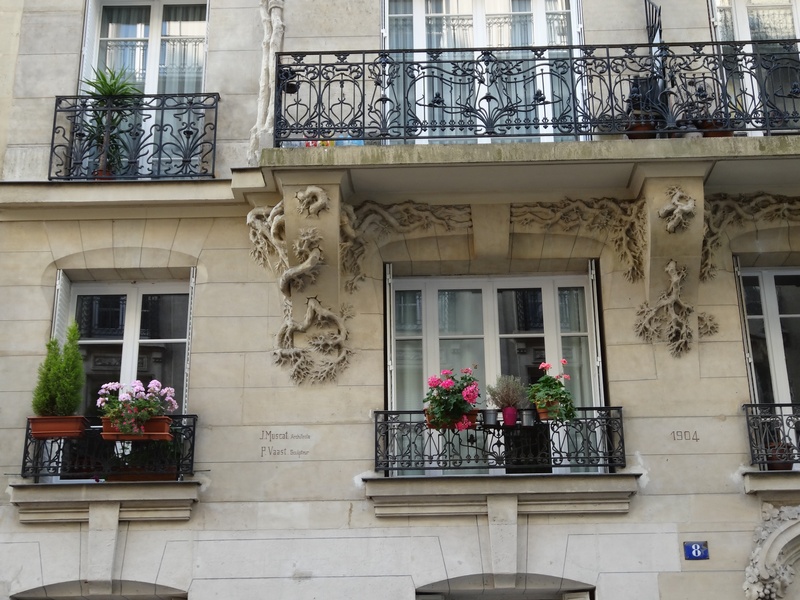 This building had beautiful tree carvings under the balcony, and then I looked up! This is one of the many things I love about Paris. Every street and every corner turned offers surprises. All this took over six hours! I was exhausted and finally stopped for a pot of tea and something to eat, only to discover that the kitchen was closed until 7:00, so I had a Lara bar with my tea and then headed home. I was too tired to try to get my pass for the Louvre, that will have to wait. The street I turned onto after my tea break offered this view. I stopped at three more stores looking for distilled water for my CPAP machine, but no luck. It takes a while to find out where to buy things in a city in another country, using another language. 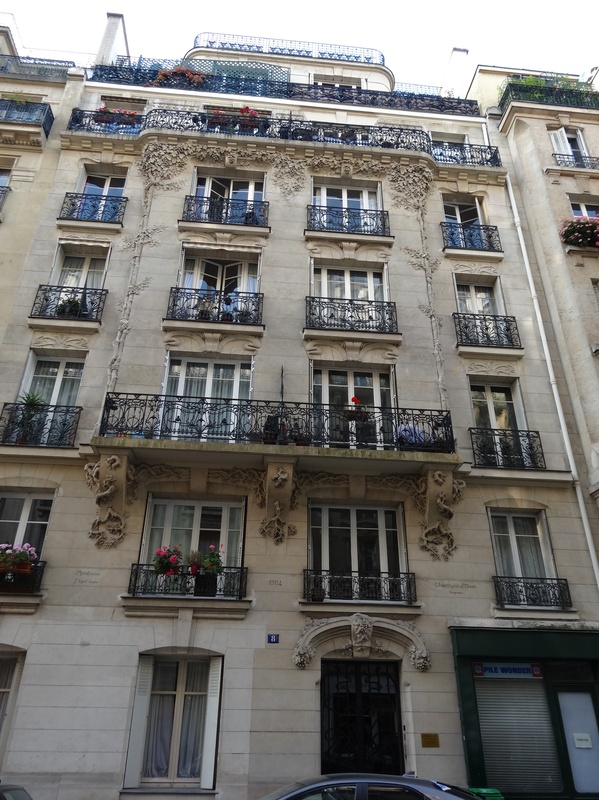 I must say that the Parisians that I have dealt with have been very kind, friendly and helpful. I am not sure if it is because I am speaking as much French as I can but I have yet to meet one rude or unkind person. I have been a bit too busy and too tired to do any drawing in spite of carrying my sketch book with me, but today I chanced upon an art studio and they offer life drawing once a month on Sunday. The artist I spoke to said there are not many studios open to tourists, that the schools require you to be a resident to attend their life drawing session, so I was fortunate to find this one. This entry was posted in Paris, Uncategorized and tagged Fat Tires Bike Tours, Kind Parisians, SIM cards by Trudy. Bookmark the permalink. I am pretty happy for me too! Thanks. Sounds like quite the adventure. You will know the city like the back of your hand! Enjoy your class, sounds wonderful. For some reason I am finding it very easy to find my way around, I am sure I will get lost soon, but that will just be an opportunity to see new things.